Mum and I decided to head out to the stores this afternoon to snag those last Christmas bargains of the season. 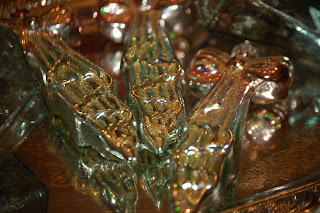 I came across this gorgeous reproduction German glass ornaments at a favourite store of ours. 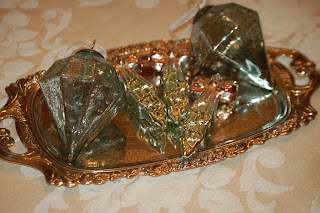 I thought the large glass prisms would look gorgeous with my other vintage ornaments in a large glass bowl, and the glass bows which look like they have been dusted with German glass glitter will hang on my miniature white Christmas tree next year. 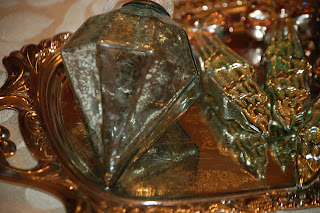 I just didn't have the heart to pack them away just yet, so I think I will keep them out for a few more weeks on my small antique serving tray. I wish you all health, happiness and luck in 2008! I wish you and your family and very Merry Christmas and a Happy New Year! 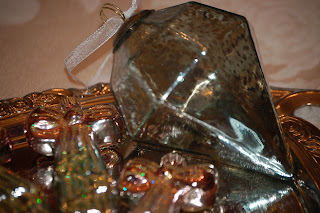 I will return to my blog after Christmas with new ideas and a new look! I'm looking forward to catching up with you all and seeing what wonderful and creative things you've done since I've been gone.